As a proactive automotive business owner or manager, you may already be thinking ahead to next year and trying to develop a plan for success in 2016. The automotive sales industry has always been competitive, and today’s automotive dealerships face even more challenging market conditions. At one time, the success of a dealership was directly related to how effective their sales team was. This is because many automotive buyers years ago would drive around from dealership to dealership to research the makes and models in person. This is rarely the case today, and most auto buyers will use the Internet to narrow down their options or even to entirely make their buying decision before they meet with a salesperson. With this in mind, a large portion of your plan for success may be related to boosting your 2016 SEO efforts. Customer Scout SEO provides you with 2016 search engine optimization digital marketing services for Ford, Toyota, KIA, Chevrolet, VW, Hyundai and more. Before you can get on the right 2016 automotive SEO road to success, it is important to identify and define what your specific marketing goals are. In order to achieve success in the marketplace and take your efforts to the next level, it is generally necessary to increase market share. There are a limited number of consumers who are in the market to purchase a new vehicle in 2016, and you must increase market share to boost sales and drive profits. In order to accomplish this goal, you need to beat the competition. Your competition is also targeting the same group of consumers, and they also may be creating a marketing plan for 2016 that is heavily focused on 2016 SEO strategies that increase their market share. If you want to be successful in the coming year, your marketing strategy must be different and better than the competition, and this is where Customer Scout SEO can help. At Customer Scout, we offer a full range of 2016 digital marketing services for Ford Toyota KIA Chevrolet VW Hyundai and more. We are an online marketing firm that is focused on the automotive industry, and we carefully monitor how today’s automotive buyers use the Internet to research makes and models as well as dealerships. We understand how they make their buying decision, and we our automotive search engine optimization experts can develop a great 2016 SEO plan for your dealership. 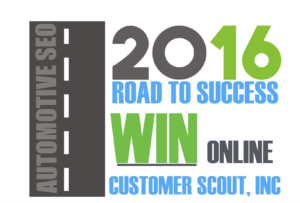 If you want to get on the 2016 automotive SEO road to success in 2016 rest assured that we can develop a strategic, effective plan that can help you to achieve the results you desire. Your marketing plan for success in 2016 may be focused on improving online marketing to increase market share and to beat the competition, but you may not know how to fully accomplish this goal. Customer Scout SEO takes a multi-pronged approach to help you improve your marketing efforts. Many dealerships already have a professionally designed website that incorporates targeted SEO keywords and phrases in it. However, the words and phrases that have been selected may no longer be the best ones. As part of our automotive SEO services, we will use expert research and analysis to locate the keywords and phrases that will drive more traffic to your website. Our SEO services do not stop there. Our multi-pronged approach will also include using back linking strategies, online articles placed in strategic locations, blog posts and more. Each of these pieces will be carefully drafted to pre-sell your vehicles and dealership to your target audience and to drive more traffic to your website. Because many automotive buyers today will form most or even all of their buying decision through online research, the content of the information that is used for SEO marketing is just as important as the linking and back linking strategies that are used in it. While the goal of a great automotive SEO plan is to drive traffic to your website, you also want your target audience to have an increased interest in your products before they get to your website. This is what an effective SEO plan from Customer Scout can do for you. Customer Scout is an award-winning online marketing firm that is focused on providing services to the automotive industry. Our 2016 SEO digital marketing services for Ford Toyota KIA Jeep GMC Chevrolet Honda BMW VW Hyundai and more are the effective solution that you need for success in the coming year. When you want to get on the 2016 automotive SEO road to success, rest assured that our online marketing experts can help you to achieve the results you desire. Now is a great time to contact Customer Scout directly and to request more information about how our services can help you to take your online marketing results to the next level. Request a No-Obligaton SEO Consultation to INCREASE your MARKETSHARE in 2016!